It is important to protect the seas, rivers, lakes and beaches from pollution in order to save the environment for our ourselves and future generations. Wow is that a swollen river? Timely post - and I love the contrast with those tall buildings in the background! Thanks for visiting! Wow! Never thought of that. Excellent take for this week's PH theme. Nice photo and great advice! Earth Day Week...yes, save the earth! This is a timely post with Earth Day being this week. I like the way you captured this scene. My photo is posted here. Where you took this photo? Looks like tsunami to me! haha! Nice photo and an excellent take on the Protection theme. Yes...we have to! And who would not love to protect and preserve a nature's beauty like that? That's so true. Lovely shot. I love how the water is churning in this photo. Great capture and an important thought, too. Yes I agree with you that pollution should be stopped, to protect beautiful environments such as in your pic. Beautiful shot and a great post. Protecting the environment is so important. 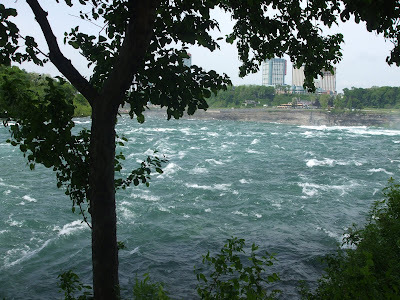 That pic looks like our Niagara Falls River, ha ha. Good call on this week's theme. Great capture on the river. Thanks for the ec drop on my blog! And btw, coz of you I found the first commented club! I'll be joinng in a while. Great post with a message! Yep! I look forward to our annual Creek week where we clean up all the junk and debris and garbage from our local tributaries. Feels rewarding! Lovely picture for the theme. I think we should bring back the glass bottles for milk that could be reused over and over... and get rid of the bottled water... the plastic chokes everything. We would recycle more but our town only takes paper, cans and plastic bottles of a certain type. No cardboard and they will leave the plastic caps from the bottles. Mine is here. I agree. Water is one of the sacred elements. Beautiful photo. great pic for the theme dearie!! Have a good monday ramblings!!! the photograph makes me feel disturbed, like a storm is coming.